I used to do posts where I would comment on a book I read recently and that I thought was really stellar. I stopped doing that because, well, I didn't read as voraciously as I should have last year. I guess this kind of post is what would be considered a "review," but I like to think of it as me just talking about a book I happened to like. Girl in Translation is a coming of age story about a girl named Kim, or Ah-Kim according to her Chinese culture. After her father dies, she comes to America with her mother from China, by way of her aunt. Instead of really helping Kim and her mother like she should, the aunt puts Kim and her mother in a run-down apartment plagued with rodents and insects and gives them a job in her husband's factory. The factory turns out to be a sweatshop. Throughout this novel, Kim and her mother fight to make their way out of the slums of Brooklyn, escape the sweatshop and release themselves from under the jealous and watchful eye of Kim's aunt. Kim's only hope to get herself and her mother out of their situation is to excel in academics. Kim's story really moved me because I know what it's like to come to the U.S. and have nothing but a dream, then build yourself up. That's the story of my family, only we had a loving uncle to look out for us and so I think we weren't as unlucky as Kim and her mother were. Kwok has done such an excellent job with the characters of this novel, especially Kim. I was heavily invested in her, so much so that I was thinking about what was going to happen to her next when I wasn't reading the novel. There are very few authors that can make me do that. 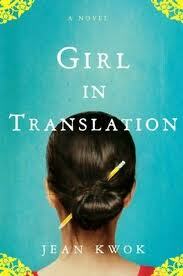 Girl in Translation is my second complete book of the year and I'm so glad that I chose to read it.